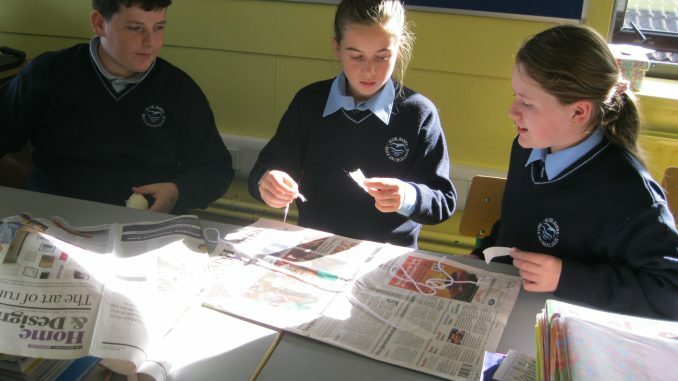 After learning about gravity and the effect air resistance on the rate of fall, Ms. O’Regan’s 6th class were challenged to design a parachute for a raw egg to land safely when dropped from their classroom window on the first floor of the school. Working together in groups of three, the students designed and made a parachute using three sheets of newspaper, string and masking tape. Interestingly, no two parachutes were the same – each group approached the task differently, trying out a wide range of ideas to achieve their objective. When the parachutes were ready, one pupil from each group dropped their parachute from the classroom window. Amazingly, five of the nine eggs survived the parachute drop!